Today's GOP: Too Much "Rand" and Not Enough "Paul"
It's tough to be disabled in America. It's tough anywhere, of course. But, as Rebecca Vallas notes: "According to the OECD, the U.S. disability benefit system is the most restrictive and least generous of all member countries, except for Korea." And nowhere else in the developed world is there a political party which routinely stigmatizes, mocks, and slanders disabled people the way Republicans do in this country. Sen. Rand Paul's recent comments were typical of the calumny Republicans routinely heap upon the disabled -- or, for that matter, on anyone in need of assistance. "I tell people that if you look like me and you hop out of your truck, you shouldn't be getting a disability check. Over half the people on disability are either anxious or their back hurts. Join the club. Who doesn't get up a little anxious for work every day and their back hurts? Everyone over 40 has a back pain." Rand Paul is far from alone in his efforts to defame the disabled. As Media Matters reports, the GOP and its allies on the far right have been engaged in a prolonged campaign of hysteria-mongering designed to convince the American people that Social Security's disability insurance program is riddled with fraud. That assertion, as the Media Matters analysis exhaustively documents, is absolutely untrue. Republicans are doubling down anyway. This week Rep. Sam Johnson, the head of the Social Security Subcommittee, hyped a couple of recent court cases in order to claim that the disability program is "plagued by fraud conspiracies." Why are they doing this? Because, as Sen. Sherrod Brown rightly notes, they want to "set the stage to cut benefits for seniors and disabled Americans." Sen. Paul, who earned a medical degree from Duke University, has either accidentally or deliberately misread the Social Security Administration's statistical data. That data shows that 27.3 percent of 2013 disability insurance recipients suffered from "mental disorders," while "musculo-skeletal system and connective tissue disorders" account for another 30.5 percent. That appears to be where Paul's "more than half" number comes from. But the "mental disorders" category covers all mental illnesses, including schizophrenia. It's certainly not limited to "people ... who are anxious." And "musculo-skeletal system and connective tissue disorders" includes more than back injuries. It covers all joints, and includes systemic diseases such as scleroderma and lupus. Some of the conditions in this category are extremely painful; some are completely disabling; some can be fatal. Sen. Paul's family denies the rumor that he's named after writer Ayn Rand. But Sen. Paul says he admires the drug-addled "philosopher," whose writings offer a glimpse into human selfishness at its ugliest and most irrationally self-justifying. 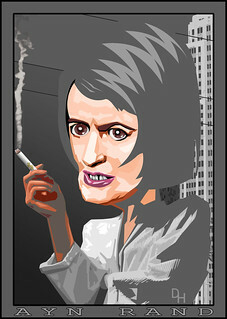 Ayn Rand's face seems to hover, pale and sepulchral, over everything the modern Republican Party does. Her contempt for those in need, and her deep hatred for those who try to help them, seem to have seized possession of today's GOP like a demon in a B movie. It can be mordantly amusing when Rand's acolytes use her amoral worldview to exploit one another. But it's reprehensible when they use it to disparage millions of Americans, urging us to abandon them in their time of need. What a shame. With a name like "Rand Paul," the Senator from Kentucky could have drawn inspiration from so many worthier namesakes. There's Dr. Paul Farmer, the global humanitarian who reportedly said "The idea that some lives matter less is the root of all that is wrong with the world." The writer Paul Goodman said "It is hard to grow up in a society in which one's important problems are treated as nonexistent." Then there's Paul McCartney, who said that "in the end, the love you make is equal to the love you take."